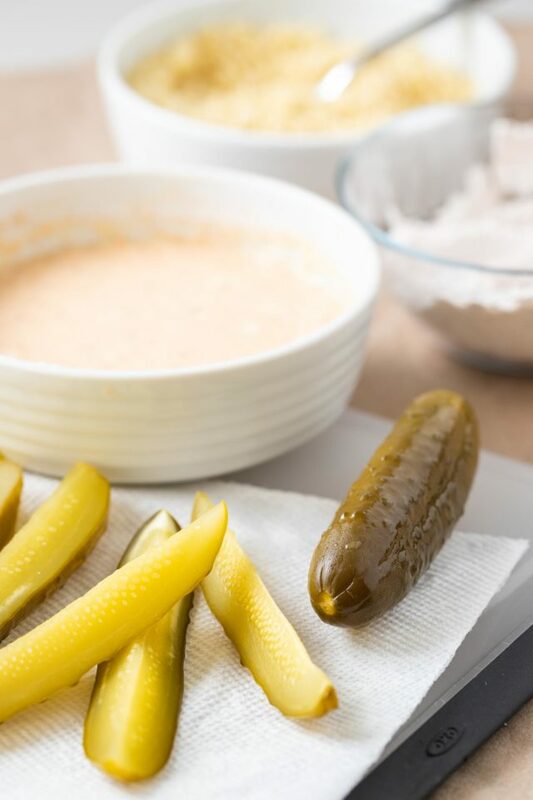 Air Fryer Pickles are super crispy and make a great game day or party snack! 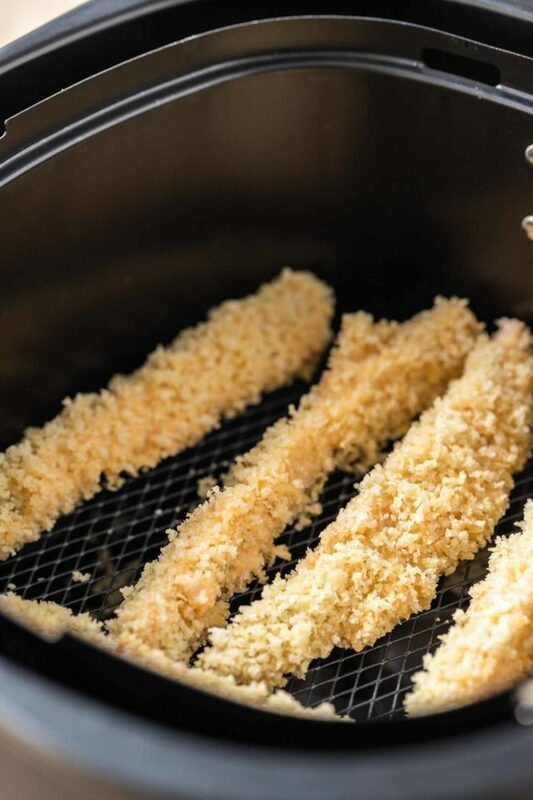 Fried Pickles made in the Air Fryer are healthier because they are made with a lot less oil and have a crunchy panko breadcrumbs coating that makes them taste even better than the deep fried original. We love our Air Fryer for making extra crispy snacks without the added calories from deep frying like our Air Fryer Onion Rings, Air Fryer Chicken Wings, and AirFryer Chicken Drumsticks! My husband and I love everything deep fried, especially fried pickles. 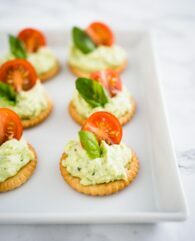 They make a perfect snack and are so flavorful, salty, and crunchy! But I’m not a big fan of deep frying at home because of the mess and the added calories. The Air Fryer is the perfect tool to make crispy fried pickles in your own kitchen that have less than a 1/4 of the calories of the deep fried version and are as crunchy and flavorful as the real deal. 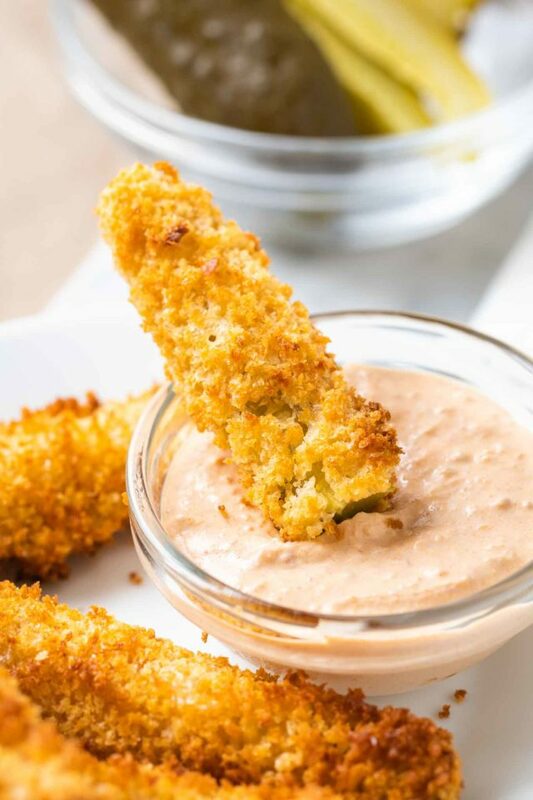 Dill Pickle spears are dredged in a spiced batter, coated with panko breadcrumbs and then air fried to crispy, golden perfection. 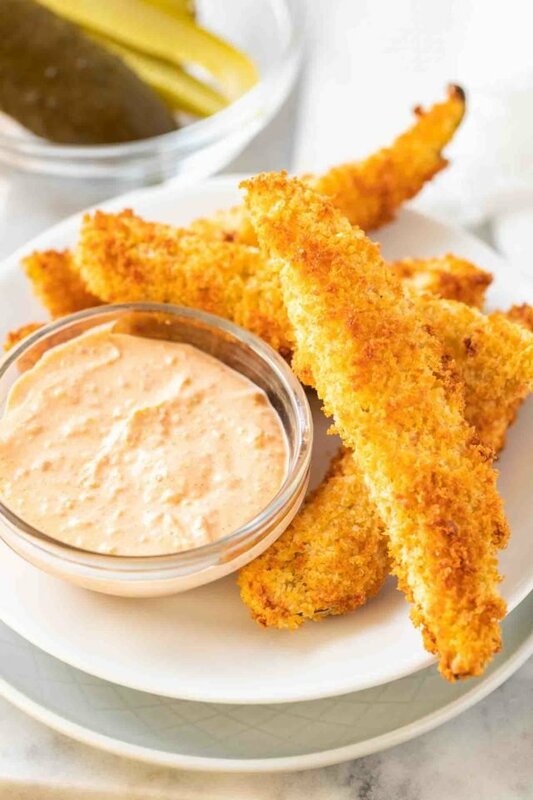 Using a batter and panko breadcrumbs gives the pickles a deliciously crunchy crust that adds flavor and makes them taste very similar to pickles that are battered and deep fried. Love deep fried pickles? 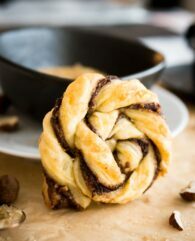 Then you have to try this Air Fryer version, you will love it even more! Pat the pickle spears dry with paper towels so the batter and coating will stick better! If you don’t have buttermilk, you can easily make your own by adding 1 Tbsp of vinegar or lemon/lime juice to a ½ cup of milk. Looking for more air fryer recipe ideas? Check out all my easy air fryer recipes! 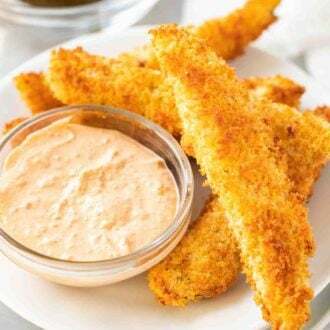 Follow the directions to dredge in flour, dip in batter, and roll the pickle spears in panko, then place them in the Air Fryer basket. Bake for 8-10 minutes at 400 degrees F until golden brown. For extra crispy, crunchy pickles, spray with cooking spray (or coconut oil) after half the cook time is over. How many calories do fried pickles have? A deep fried pickle is much higher in calories than an air fried pickle. A deep fried pickle spear contains about 170 calories, while an air fried pickle spear contains only about 40 calories. What to serve with Fried Pickles? Serve with ranch dressing or your favorite dipping sauce. This is my go-to brand for breadcrumbs! I usually buy them at Costco. Want to try this Air Fryer Snack recipe? PIN IT TO YOUR SNACK BOARD TO SAVE IT OR SHARE ON FACEBOOK! Air Fryer Pickles are super crispy and make a great game day or party snack! Dry the pickles with paper towels. You need three shallow bowls or deep plates. In the first one combine flour, paprika, garlic powder, black pepper, cayenne pepper, and 1/2 tsp salt. In the second combine buttermilk (or milk and vinegar/lemon juice) and egg, then add ¼ cup of the flour mixture from the first bowl. In the third combine panko breadcrumbs, remaining 1/2 tsp salt and olive oil with a fork until the oil is evenly distributed. Dredge the pickle spears in the flour mixture, drop them in the buttermilk mixture and then dredge them in the panko mixture until coated evenly. Place pickle spears in a single layer in the Air Fryer basket. 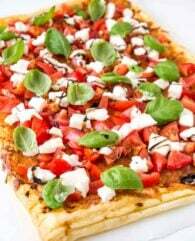 Use a rack to make a second layer. Cook at 400°F until golden brown and crispy, about 8-10 minutes. Spray with some cooking spray after about 6 minutes for a more golden finish. Repeat with remaining pickles spears. I’ve never tried frying pickles with panko! Sounds so delicious. Thanks for sharing, cannot wait to make these at home! Just the right amount of tanginess and crunch. Fried pickles are EVERYTHING!!!! I basically need to run out and buy an air fryer STAT! I need these pickles like woah!